Below I've collected several tips for how to remove crayon in dryer, if you accidentally wash, and then dry some crayons in your child's pockets. There is both a video, and also several suggestions for both homemade cleaners and commercially available products you can use to help with this common problem in homes with kids. If you have yourself suffered from this problem, I would love to hear how you cleaned it up too. You can share your tips for crayon removal from dryer here, or read other tips already collected for other common problems related to cleaning up crayons. In addition, you can read lots of dryer cleaning tips here, for removing all kinds of things from this appliance when there's a laundry disaster. Join in and write your own page! It's easy to do. How? Simply click here to return to remove crayon stain . Removing crayon from your dryer is not a fun thing to do, but neither is having to rewash multiple loads of laundry to get out crayon stains. If you accidentally wash, and then dry crayons in your dryer, along with a load of clothes, you inevitably get crayon stains of melted crayon wax all over your clothing. In addition, that wax also can get onto your dryer drum. Before you do another load of clothing and throw it in the dryer you need to get rid of those melted crayon bits that are stuck all over the dryer drum. Below is a video giving step by step instructions for removing crayon from the dryer. 1. 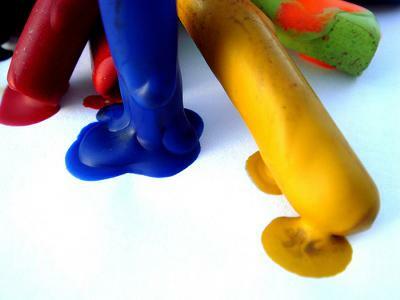 Throw some old towels into the dryer for a couple of minutes on high to loosen and soften the melted crayon again, to make it easier to remove. 2. Make a paste of dishwasher detergent and water and use this to scrub your dryer drum to remove all that melted crayon. 3. Then, wash off the dishwasher detergent paste with soapy water and a rag. 4. Finish running some old towels through the dryer for a full load again, just to make sure you have removed all the crayon and not missed some spots so you don't ruin any clothing when you put it in. Besides a dishwasher detergent paste, some people use WD-40 or Goo Gone to get rid of crayon marks from the dryer (see tip below). ***Please note with either of these methods you need to air out your dryer fully before re-use because these products could be flammable, but there are even more suggestions below that don't run quite this risk! 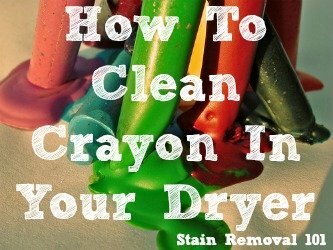 You can learn tips for crayon stain removal from clothes here if this mess got on fabric as well as the dryer. Further, you can share your dishwashing detergent uses for cleaning and stain removal here, if you know of even more ways to use this common household cleaning supply for cleaning other stuff in your home, or check out the other uses I've already gathered together. Melted crayons in the dryer are a nightmare, but there is hope! We know we should always check all pockets before we do a load of laundry, but sometimes things happen and we forget, or something slips through. Well, what do you do when that something is a red crayon that goes through the wash and then melts all over the dryer? 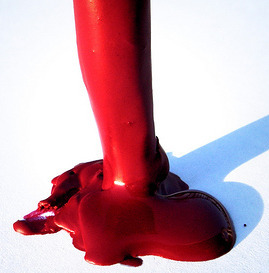 Picture it -- now there is red crayon melted all over the clothes, and on the dryer drum. This exact thing happened to Kristen and she used Goo Gone to clean the melted crayon off of both her dryer drum and the clothing itself. Thanks Kristen for this tip! 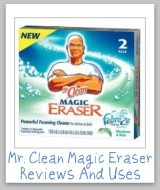 Mr. Clean magic erasers takes it right off. I wouldn't recommend WD-40 considering it's highly flammable. I tend to agree with you, especially when readers like you keep making awesome suggestions like this one. It is amazing what the Magic Eraser can do, isn't it? I've gathered even more uses for this product here that you might want to check out. Oh my goodness!! My son left a black grease marker in his work pants, my dryer and drum were completely black!!! I googled how to get melted crayon off the dryer and read all the remedies. I have never used the Mr. Clean Eraser but I remembered I had a sample! In five minutes my dryer and drum are crystal clean and white!!! I am a believer and will always have one on hand!!! Thank you thank you thank you!!! Heather wrote in to share what worked for her to remove these marks. I was hesitant to use WD-40 or Goo Gone because of their flammable properties, and I have a gas dryer. 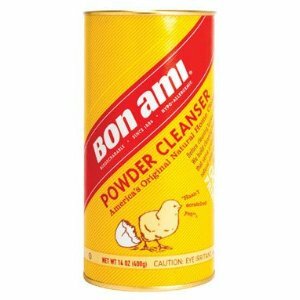 So I thought I'd try my trusty Bon Ami, which always gets tough grease stains off my cookware. Sure enough, it worked like a charm. It has enough abrasive action that it got even the tough stains out that I thought were there for good. Thanks Heather for sharing this tip! I'm glad to know of some more eco-friendly alternatives for fixing this common laundry mishap. I'd love to hear from even more people who've had success removing crayon from their dryer, to tell me how you did it. You can share your tips here, or read other ways that people have cleaned all kinds of things out of this appliance. Yes, you can use a Mr. Clean eraser in a gas dryer. Unlike some of these other suggestions, where you're adding a liquid product to the dryer drum, when using a magic eraser you're basically using a product that works like very fine sandpaper, so it doesn't matter if it is a gas or an electric dryer. As always, with either type of dryer, wipe out any residue left behind from any product used to clean it before turning it on again. 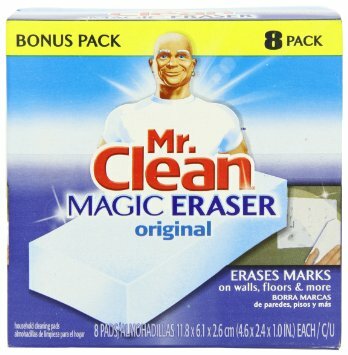 Can you use Mr. Clean Magic Eraser in a GAS dryer????????? Mr. Clean Magic Eraser worked! I have never had to get crayon out of the dryer before but I must say that I did try the WD-40 and if it's a small stain or area of melted crayon that might work but mine was far worse. The crayon had left stains all over the dryer drum, wall and even the door. I tried the WD-40, not much luck. So I checked again for advice and saw the magic eraser. I went to the store and for around 3 dollars I got the magic eraser and it worked like a charm. Had to use a credit card to scrape the cracks but it took literally 5 minutes to clean the dryer drum and door. Thanks for the help!